Not very many responsible anglers will keep trophy walleye, pike or trout for table fare. Regulations in our province prevent this in some ways, examples being; only one pike over 75 cm or only one walleye over 55 cm allowed kept. Certain bodies of water have slot sizes where within a certain size, species must be released. Some anglers like a walleye in between 16 - 20 inches to keep to eat, they don't want to take the big spawners. 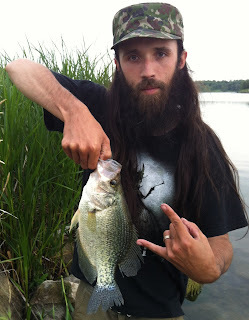 Why is it then that some haven't a problem catching and keeping trophy perch or crappie to eat. The catch and catch again segment from http://www.uncutangling.com/ can apply to smaller fish too!! A simple answer is, panfish are such prolific spawners, harvests are needed to sustain good sizes and prevent stunting. This is true, however a ten to twelve inch perch or crappie tastes just as good as a fifteen incher, and letting the bigger ones go keeps those genetics in the body of water. Our water bodies are considered northern range, and crappie up here can take five to ten years to break 12 inches. I enjoy catching all kinds of species and feel they all have their place, from the "nuisance" bullhead to the hungry pike. Once and a while we will keep a meal, if we all caught and released everything we hooked into, we wouldn't be able to fish, it would be deemed cruel and unusual towards the fish. I'm not a seasoned veteran of the sport, but I plan on fishing and learning for as long as I walk the earth, I may not personally have children, but I want the children of the future to have the same chance at fishing our provinces diverse water ways as I have had. With the word spreading of great fishing at some smaller bodies of water in the province, some will take advantage of this and abuse the resource, others will feel it necessary to keep a large pike to protect the perch or crappie. Large predators are needed in these bodies as well, they help maintain balance!. Some can say that the males are smaller when it comes to some species and removing just males can harm populations as well, I will not argue this. After pursuing crappie and perch along with lots of other species, appreciating the beauty of all different sizes and striving to beat my personal bests, I realized many things. Perch and Crappie this size are a true pleasure. Fish like this make bigger fish, we need to keep them going and keep fish with these genes in the lake to make more big perch/crappie. With or without the internet people will fish them out, and not think about the quality of the fishing. CONSERVATION is key!!! What has happened in the past with over fishing and people filling freezers and not understanding limits can change if we all do our part, keep an eye out and share responsible angling practices with friends and family. If you are lucky enough to get into fish like this, Please put at least some of them back!! Keep some of the smaller ones for a dinner, and leave the trophies for a better future of fishing, and a possible new Manitoba record! If we all do this, slabs and footballs like these will become the norm, not all the buzz for a few short years and then the distant memories.